"The Inventor: Out for Blood in Silicon Valley," in which Alex Gibney does for Elizabeth Holmes and her biotech firm what he did for Enron -- namely, expose and eviscerate them. Alex Gibney's HBO documentary is part thriller, part tale of corporate whistleblowers and perhaps foremost, a warning of how an apparent fraudster spouting tech jargon can bedazzle people who really should know better. 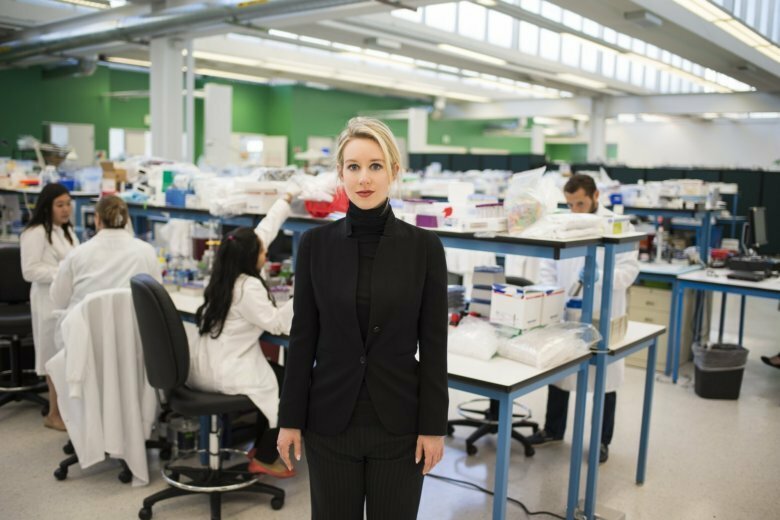 Anyone who thinks Theranos is the villain in the next Avengers movie really needs to watch “The Inventor: Out for Blood in Silicon Valley,” in which Alex Gibney does for Elizabeth Holmes and her biotech firm what he did for Enron — namely, expose and eviscerate them. Gibney’s HBO documentary is part thriller, part tale of corporate whistleblowers and perhaps foremost, a warning of how an apparent fraudster spouting tech jargon can bedazzle people who really should know better, or at least, harbor more skepticism when asked invest millions in a startup company. Barring that, viewers might come away simply hypnotized by Holmes, who carefully cultivated her own myth, played the role of company cheerleader to the hilt and wigged out even employees with her robotic speech pattern and unblinking interviews. A college dropout at age 19, Holmes built Theranos into a multi-billion dollar entity, while concealing that its main product — The Edison, a device that promised to “revolutionize” health care by diagnosing illnesses using finger-prick samples of blood — didn’t actually work. “Four years later, it was worth less than zero,” Gibney, who also narrates the documentary, soberly intones near the outset. “The Inventor” then methodically charts the course of that rise and epic fall, which — in one of several beyond-fiction twists — was hastened by the grandson of former Secretary of State George Shultz, Tyler Shultz, who joined Theranos as an intern via his grandfather’s connections as one of the marquee names on the company’s board. In assembling his case (the one quibble being he could probably do with fewer close-up shots of blood being drawn), Gibney makes a lot of folks who bought into Holmes’ spiel look awfully foolish with the benefit of hindsight. Still, the larger message goes well beyond this particular story to a Silicon Valley culture where greed wasn’t good in the long run but was, and is, highly exploitable. As so many of these situations are, Theranos is also a media story — specifically, one that exposes the cult of the celebrity CEO, which has become a popular trend in business journalism. From the journalists interviewed to video of CNBC’s Jim Cramer, that dynamic allowed Holmes not to create a new technology, but rather to wow investors merely by perpetuating the illusion of having done so. Theranos has been described as a cautionary tale, as well as an indictment of a wider Silicon Valley culture that preaches to “fake it till you make it.” That seems especially true in the previously unseen video that Gibney has acquired of Holmes delivering speeches to rally the troops, promoting an us-against-the-world mentality that justified the company’s obsessive secrecy and paranoia. For that reason and others, “The Inventor” is one of those documentaries that — unlike The Edison — really gets under your skin. “The Inventor: Out for Blood in Silicon Valley” premieres March 18 at 9 p.m. on HBO.